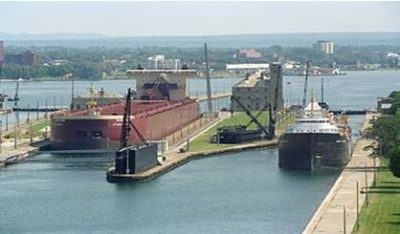 President Trump is seeking more than $75 million for work on the new Soo Lock project in Sault Ste. Marie. The U.S. Army Corps of Engineers says the money would be used to start construction of the upstream approach walls, continue the design of the New Soo Lock chamber, and finish construction of the upstream channel deepening. The Corps tells us the upstream approach walls will stabilize the existing approach walls to allow for modern vessels to tie up and wait their turn to pass through the new lock. It’s anticipated the wall designs will be finished in late 2019, and the construction contract will be awarded in summer 2020. Army Corp Lieutenant Colonel Greg Turner says the appropriation keeps the project on track for completion in seven to ten years from the start of construction. You can find out more about the new Soo Lock project right here.